Francesco Cangiullo, from Naples, was essentially a comedian; his theatrical attitude towards life that turned whatever he did into a performance. For this reason, Cangiullo could have equally well been a Futurist, a Dadaist, or a Surrealist. Indeed, in 1916, Cangiullo's writings were published on the pages of the Zurich Dadaist journal Cabaret Voltaire. This volume featured many "words-in-freedom" of hilarious and ludic tone, with a dramatic and almost surrealistic bend. 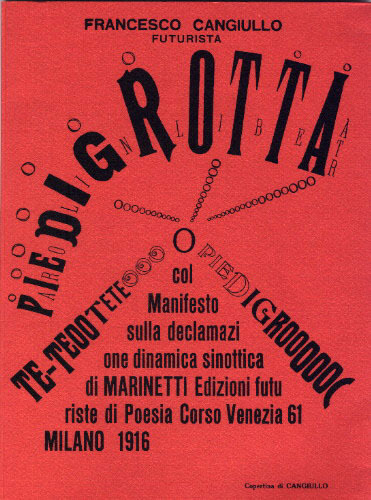 Cangiullo's Manifesto on the Dynamic and synoptic declamation theorized a kind of robotic and syncopated declamation. The title and cover illustration, Piedigrotta, come from an annual Naples folk tradition, a pyrotechnic feast with extraordinary fireworks. These elements suggest the explosive thrust of Mt. Vesuvius, the volcano that stands over the gulf of Naples. Futurist evenings were also explosive. Originally introduced as literary and artistic evenings, they often turned into riots with people fighting, screaming and throwing all kinds of objects onto the stage. Cangiullo's Piedigrotta features both explosive content and form.